Last week I wrote about a few Galicia genealogy websites. I hope people found new resources and took away a few ideas on finding their ancestors from Galicia, Spain. This week I would like to focus on the same family as last week, but take a look at how we found the ancestral town of the family line from Salamanca, Spain. As mentioned last week each line had varying information on where they came from in Spain. The Juan's and Pacheco's that I was researching in this case came from Salamanca. The family information said that Lorenza Pacheco was born in Gallegos de Aragan, and did not know the town Manuel Juan was born, but knew it was in Salamanca. Believe it or not one of the biggest problems I face in Hispanic genealogy is misspelled town names. 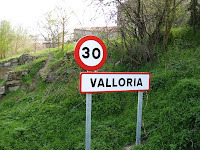 Last year I spent 2 months trying to find Baloria, Soria, Spain (spelled Baloria in a birth certificate), only to find that the town was actually spelled Valloria. The Gallegos misspelling was a little easier, but the tools I used were exactly the same. Here are a couple of tools and techniques that you can use to pinpoint that hard to find ancestral town (in somewhat the order that I use them). 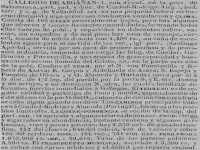 The Family History Library Catalog (FHLC) - Since I knew that the diocese of Ciudad Rodrigo (western part of the Salamanca province) had been microfilmed I thought I would start here hoping that Gallegos was in this diocese. I tried with the current spelling, but did not find it. Might I suggest that if you don't find the town you are searching for in the FHLC that you try the View Related Places option. To use this option what you will want to do is search for the province (or equivalent) where the town resided. Once you have performed this search click the View Related Places button and you will see all the towns within that province for which the Family History Library has records. I scrolled through the list of towns in Salamanca and sure enough found a Gallegos de Argañan. http://www.pueblos-espana.org - One of my favorite map sites for Spain. You can search for a town, or click on the province's name and scroll through the list of towns within that province. Often times the site will have photos of the town. Click here to visit the page for Gallegos de Argañan. Please be aware that not all towns will be listed, sometimes you will find that they are missing one or two. Google Earth - A fun and interactive way to pinpoint an ancestor's town. Sometimes you will be surprised by a picture. This is a one time download to your computer, and can be addicting, so use sparingly. 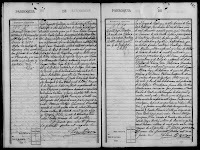 After finding the correct spelling of Gallegos de Argañan, and finding that it was in the diocese of Ciudad Rodrigo I consulted the microfilms and found Lorenza's baptism. Now I needed to find Manuel's birthplace. To do this I turned to the Gallegos marriages knowing that couples normally marry in the bride's parish. I quickly found the marriage certificate, and found Manuel's birthplace as well as his parents - in this case they were all born in a neighboring town called Espeja. From this point I checked the FHLC, the Pueblos de España website, and the Madoz gazetteer making sure that I had the correct spelling, and also learning about the political and ecclesiastical jurisdictions. This was a pretty easy case to solve given the information I started with, however it is a good example of misspelled place names. After finding the correct spelling of Gallegos de Argañan, and finding Manuel and Lorenza's marriage over 100 hundred ancestors have been found and added to the family tree. If you have a similar misspelled ancestral town situation in your research try some the resources/techniques mentioned above, and if you're still having problems wait until next week for another idea. If you can't wait until next week send me a message and I'll see if I can find it for you.